Elon MuskSpaceX ocean landing pad. Elon Musk’s latest twitter announcements are the stuff of SciFi: He’s just tweeted out images of the company’s latest achievement — a drone ship that will be a self-stabilizing landing pad for rockets — even in rocky seas. 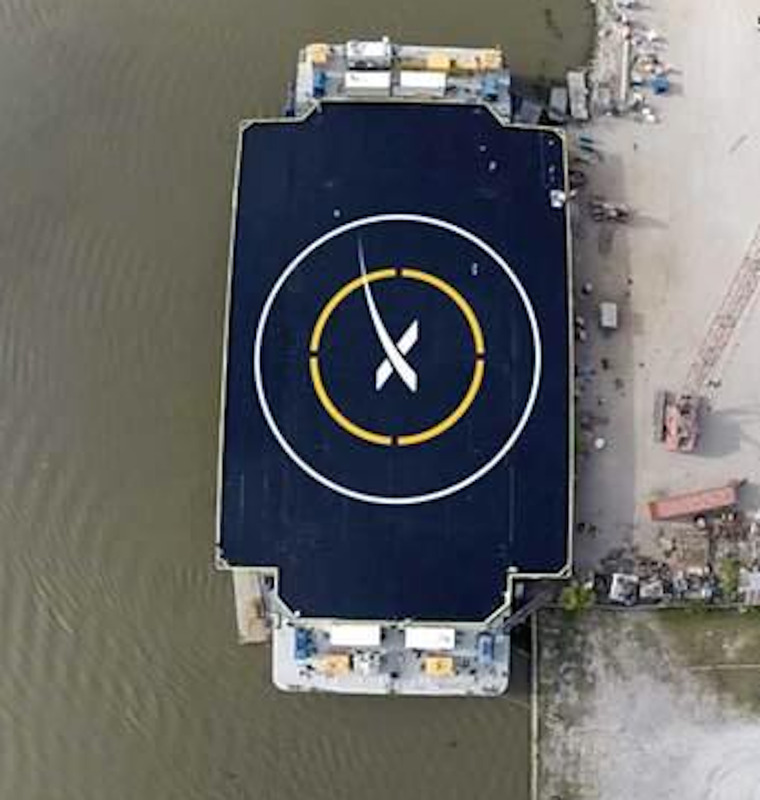 SpaceX is about to start using these ocean-based landing pads to catch their Falcon9 rockets. The first landing attempt is scheduled for December 16. Before SpaceX, rockets used to deliver cargo and people into space would re-enter Earth’s atmosphere, and either burn up or crash land in the ocean. But there’s a big problem with that crash landing: these incredibly expensive rockets are destroyed in the process. And for space travel to really take off, it needs to be more like air travel. We couldn’t transport people and cargo as quickly and easily as we do if aeroplanes were destroyed at the end of each trip, so why should the future of space travel depend on spaceships that are only used once? Musk, eager to create a reusable rocket revolution, is making big strides toward his goal. 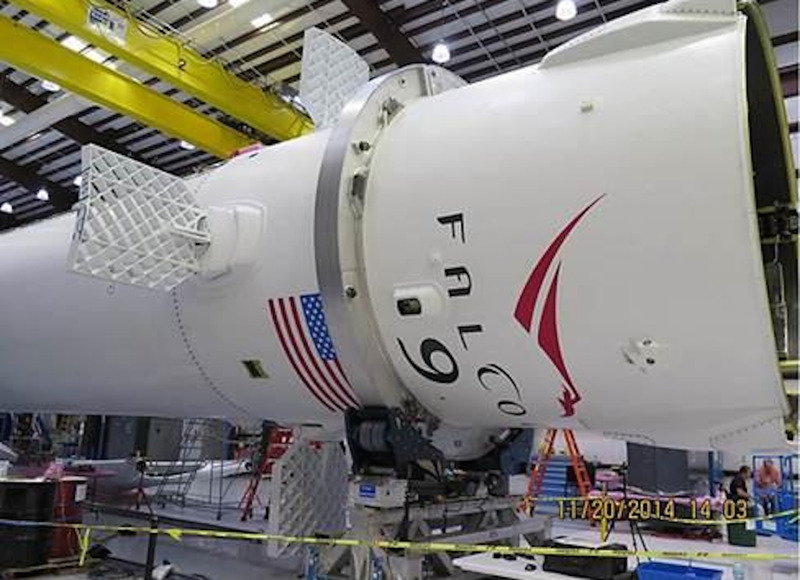 A Falcon 9 rocket is the tall cylindrical section of the spaceship that carries the fuel. It towers 14 stories high and generates tremendous thrust to transport the Dragon spacecraft, located on top of the rocket, into space. Once the rocket exhausts most of its fuel, it detaches from Dragon and falls back to Earth. To save and reuse these rockets, which cost $US300 million to build and $US61.2 million to launch, SpaceX equipped their Falcon 9 rockets with thrusters that fire as the rocket falls toward Earth. The thrusters reduce the rocket’s speed and keep it vertical, so that when it reaches the ocean’s surface, it’s positioned upright and moving at a slow enough speed to safely touch down without damage. This is called a soft landing. The first successful “soft landing” of a Falcon 9 rocket happened in April of this year, though the SpaceX team was unable to recover the rocket due to rough ocean conditions. And, as the team eventually learned in further tests, following landing, the rocket tipped on its side and the force from that tip damaged the hull. Therefore, the rockets were never recovered or reused. In addition to the thrusters, the rockets that completed soft landings in April, July, and September of this year also deployed a set of landing legs before touch down. Although the legs were not necessary for a water landing, it was important for SpaceX to make sure the legs would deploy for the next stage in rocket landing — on a floating, solid platform. To save the rocket, it needs a safe place to land where it won’t fall sideways into the ocean. For this, SpaceX has built an autonomous drone-ship that can keep itself stable even in heavy seas. During next two resupply SpaceX flights, scheduled for this December 16 and January 23, 2015, the Falcon 9 rockets will attempt to land on the floating platform. And SpaceX suspects that they have about a 50 per cent probability of being successful on the first try. The company has succeeded in the past with bleaker chances than that. The “X” in the image above marks the spot where the reusable SpaceX rockets will land. Staying on target is crucial: The main base is slightly smaller than the size of a football field, but that’s plenty of room for the rocket’s landing legs, which take up 18 feet of space. Base is 300 ft by 100 ft, with wings that extend width to 170 ft. Will allow refuel & rocket flyback in future. And if it doesn’t work out, at least the spacecraft will be far from populated areas, so no one is in danger if something goes wrong. Elon MuskSpaceX Falcon 9 rocket equipped with x-wings. The rocket’s recently-added hypersonic grid fins (called X-wings and shown above) are another major improvement added to Falcon 9 for the December 16 launch. As the rocket nears the landing pad, the wings rotate clockwise and counterclockwise to steer the rocket toward its target for a successful landing. Mini-X-wings were deployed during a test flight on a rocket earlier this year at SpaceX’s facility in McGregor, Texas, you can see how the rocket — after reaching a maximum height of about 0.6 miles above ground — deploys the fins in preparation for landing.